In our group we investigate materials interacting with light in ways that can probe and modify key materials properties. One thread of our research is dedicated to dynamics of emergent ordered phases in complex materials. These interesting phases comprise superconductors, charge- and spin-density waves or excitonic condensates. Below you see an animation showing how a sequence of light pulses with specific polarizations can rotate an entire chiral condensate (a two-dimensional topological superconductor) from right-handed to left-handed. 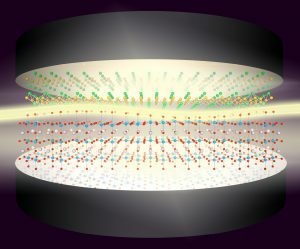 We envision that this could be used for quantum information processing with chiral Majorana fermions. Cavity quantum-electrodynamical environments can affect materials with pure quantum fluctuations of light. This is used to change properties of molecules and chemical reaction pathways in nanoplasmonics and polaritonic chemistry. We have recently proposed to also use it for cavity materials science to change fundamental couplings that critically affect materials properties. The image below shows an illustration.